[by means of] this (pn). god. to (can) breathe (snsen)., [for] to become the great pillar. this (pn). god. [for] existence of hail. ; [through] existence (eden’s). the Sebekht-gate. of [=for]. to enter (ãq). this. god. [of] existence. [by in] the sebekht-gate. speech. 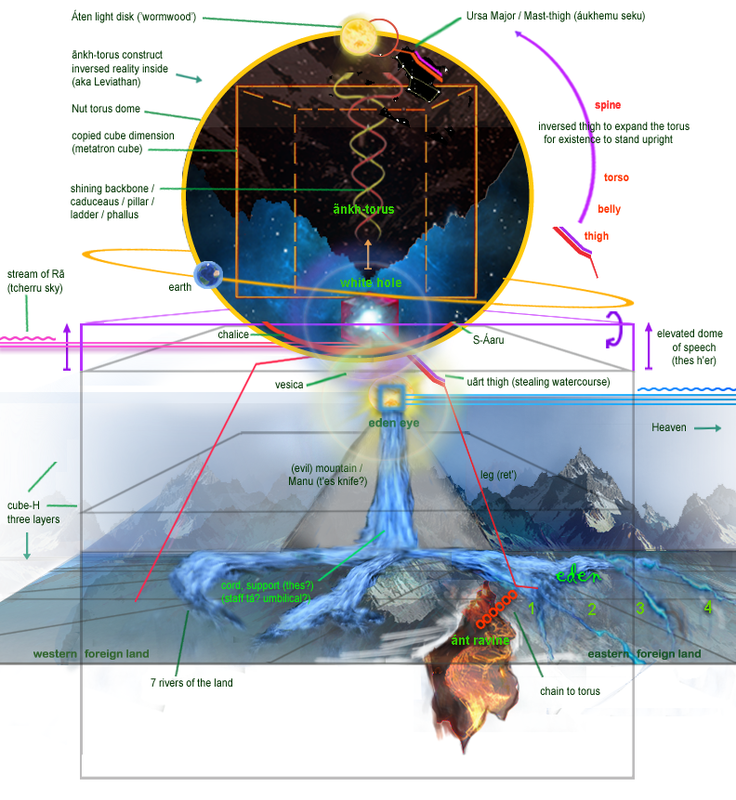 - reads: “the light (eden’s). [as] he (the). willpower. (for) willpower (matrix). [by?] he. - reads: “the light (eden’s). [of] willpower of speech. [of] existence., [for] existence. the many (ãsh).\\ lights (mixed). [as] the peace [of saturn] (h’etep). ; of [=as]. 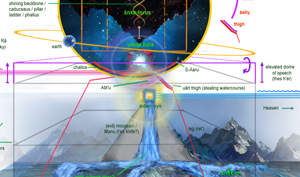 In the middle of this Division we see the boat of the sun being towed on its way by four gods of the Tuat; the god is in the same form as before, and his boat is piloted by SA, who commands, and by HEKA, who steers according to his directions. 2. 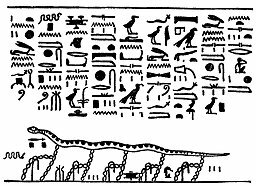 The serpent APEP, fettered by five chains which enter the ground; the fetters are further strengthened by small chains, which are linked to the larger ones, and are fastened to the ground by means of pegs with a hook at the top. 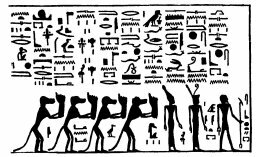 In an earlier picture we have seen APEP fettered by Seb, Mest, Hapi, Tuamutef, and Qebhsennuf, who were represented by five gods, but here the figures of the gods are wanting, and it is only the legend “Children of Horus,” that tells us the chains represent the gods. 3. Four Apes, each holding up a huge hand and wrist. 5. 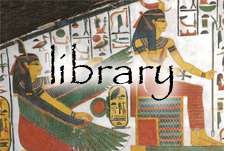 The goddess of Lower Egypt, wearing the Red Crown, and called HERIT. 5. 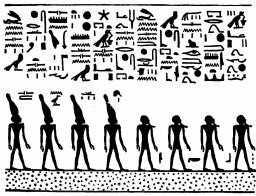 Four hawk-headed gods, each holding a sceptre in his left hand; these are called HORUS, ASHEMTH, SEPT, and AMMI-UAA-F.
“to become the great pillar. this. god. [of] existence (matrix)., [by means] of [=by]. the things of the workplace. which is. the thing to ferry-over (to north). [in order for] to go guide. them (ad.souls). who are. [for?] he. the words to transform. of [=as]. he (the). house. [of] speech. [like] the divine\\hand., [and by] the original adamite soul. [are] it. the things of speech. [of] the house. 3. 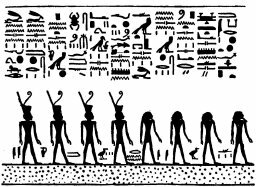 Four gods, each wearing a Crown of the North; these are the KHNEMIU. 7. Four females, without crowns. 8. 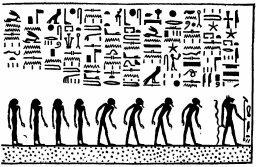 Four bearded gods, with their backs slightly bowed; these are the gods who praise Ra. 9. A cat-headed god called MATI.